Voted as the “Best Family Destination” in Europe, The Westin Resort Costa Navarino is also the No.1 luxury golf resort in Greece. The Westin Resort Costa Navarino features 445 rooms and suites with most enjoying unobstructed views of the Ionian Sea, many with family rooms or infinity rooms including infinity pools. Dunes Beach stretches for 1km alongside the Ionian Sea. The sandy, west-facing beach provides guests with chairs, towels and parasols. A beach volley court is available for active beachgoers and a qualified lifeguard is on duty throughout the day. Enjoy a range of water sports such as wind surfing, diving and sailing at Navarino Sea water sports centre. Agora at Costa Navarino presents an authentic village centre features exclusive stores and several entertainment venues such as an open-air cinema and a traditional Greek amphitheater. A variety of cafes, bars and restaurants include the Kafenio, a revival of the time-honored Greek coffee house, Souvlakerie, a genuine souvlaki corner, the Italian taste of Da Luigi and the 3 Admirals bar. Costa Navarino is located 50km from Kalamata Airport and 270km from Athens with private transfers available on request. Kardamili, a beautiful seaside village located in Mani. 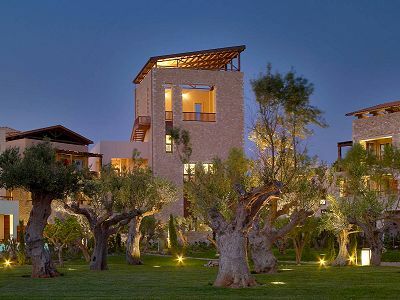 Enjoy an Inclusive 7 Night Pro Package at the spectacular Westin Costa Navarino, Greece. Price for alternative dates on request. *1 Pro free (bed, breakfast, and golf) for every 7 paying guests (PGA certificate required). If the group has less than 7 paying guests, the cost for the Pro is at 50% of the single room. *Pro Receives 20% discount on Laundry for duration of stay. Book 5 Golf Club Rental at The Dunes Course or Bay Course for 5 Rounds at a "Travel-Lite" Special rate! Booking Terms: Price per person for 5 rounds Golf Club Rental. Listed Package Prices: Listed Golf Package price applies with optional supplement for Golf Club Rental. Crystal clear seaside elegance meets optimum comfort with contemporary furniture lines, light wood, and the muted tones of sea and sand. Breathe in the fresh coastal air from your private terrace or patio overlooking olive trees, landscaped gardens or swimming pools. Maximum Occupancy 3 Adults or 2 Adults and 1 child in Sofa Bed and 1 Baby Cot. Refreshing views of The Ionian Sea over the resort's landscaped gardens. Contemporary décor in pleasant seascape tones, floor-to-ceiling glass doors and private open-air balcony, contribute to a relaxed ambience. Sea front view with their floor-to-ceiling glass doors, and private open-air terace, all with an unobstructed view of the majestic Ionian Sea. A truly refreshing atmosphere awaits you with contemporary interiors in pleasant seascape tones and beautiful light wood furnishings. Recharge your senses and refresh your spirit while napping, or enjoying an alfresco drink in your individual infinity pool (23m²), just steps from your Westin Heavenly Bed®. Luxuriate in the sleek and elegant design of your room decorated in a pleasing palette of refined taupe and sand with views over the resort’s olive trees, landscaped gardens and swimming pools. Sea front views of the Ionian Sea from the beachfront location each with its own private infinity pool (23m²). Escape from daily stress and relax to the natural rhythm of Costa Navarino, enjoy a cocktail before dinner by the pool as day tapers into night. Need a little extra room to stretch out? Junior suites at Costa Navarino offer a separate lounge area to put your feet up and unwind. Junior Suites also feature private terraces and patios with a variety of views overlooking the resort gardens, pools and olive trees. Sleeps a maximum of 3 adults and 1 child or 2 adults and 2 children in corner sofa bed and 1 baby cot. Allow your senses to expand in the extra space afforded by Junior Infinity suites complete with an individual infinity pool (23m²). One-bedroom Family Suites offer a spacious lounge area with a delightful space for relaxing and socializing, with a separate bedroom for uninterrupted calm. Your private terrace offers mixed views over the resort pools, olive groves and landscaped gardens. The setting is just right to escape from the pace of daily life and soak up the atmosphere of the Navarino Dunes. Sleeps a maximum of 4 adults and 1 child in rollaway or 2 adults and 3 children in double sofa bed with an extra bed and 1 baby cot. For the ultimate in luxury right on the Mediterranean's shore, premium suites capture a glorious Ionian Sea view and offer a new dimension in graceful comfort. With a separate bedroom and lounge including a dedicated dining space and expansive terrace. Unpack your senses and transform your holiday into a renewing experience in one of our one-bedroom Infinity suites. Gather at your very own private infinity pool for a refreshing dip while basking in the glow of a legendary Costa Navarino sunset. Or take advantage of the separate lounge and dining area to put your feet up and unwind at any time of the day. Infinity Suites enjoy views over the resorts pools, landscaped gardens & olive trees. Diverse evening buffets showcasing a wide array of international cuisine provide the opportunity to choose your favorite bottle of wine from an extensive wine selection. 1827 Lounge: Try a vodka infusion, or an exotic Jasmine Pearl Martini, amidst elegant décor dominated by dark wood and native stone. 1827 is named after one of the most important events of the Greek War of Independence, which took place in the adjacent Bay of Navarino. The Westin Pool Bar: The sound of the Westin waterfall provides a relaxing backdrop for this pool restaurant offering snacks and light dishes with a Lebanese flair, including the “Shawarma” which is the authentic Middle Eastern “Gyros” and a variety of freshly homemade pies made with SAJ Pita bread. Lagoon Pool Bar: Cool beverages are served, combining healthful extracts such as locally harvested, vitamin-rich bee pollen or Aloe vera, advocated by the renowned Greek physician and pharmacologist Dioscorides and used for centuries as an ingredient in herbal medicine. Barbouni: Enjoy delicious freshly caught fish complemented by chilled Greek wines or refreshments and served either at the bar or at your sun lounger. The name Barbouni is Greek for ‘red mullet’. One of the most valued fish in antiquity, this Mediterranean delicacy which could very well be on the menu as the Catch of the Day. Da Luigi’s: The interior offers an authentic Italian dining environment with warm brick and colorful tile décor. This Italian experience can also be combined with the time-honored Greek tradition of summer cinema, as you savor your meal in Da Luigi’s outdoor seating area while watching a film on the Agora movie screen. The Diner: Experience the timeless appeal of a 1960’s-style American diner offering grilled favorites cooked to order and extra thick milkshakes. A full afternoon or evening’s entertainment awaits in an authentic setting to the music of the rock-and-roll years, with ten-pin bowling, pool, video games and an indoor cinema. Flame: Classic and signature cuts, some exclusive, are served on large wooden platters, complemented by the freshest ingredients from carefully selected small-scale producers in the surrounding area. Many of the specialty herbs and vegetables are handpicked by our chefs, direct from the restaurant’s purpose-built gardens. Nargile: The aromas, images and sounds of the Middle East come to life as your taste buds delight in the flat breads, salads and grills of fine Lebanese cuisine. Indulge your senses with an authentic shisha experience in an alluring Levantine atmosphere. Inbi: The ethos behind Inbi is the respect of the Japanese tastes and traditions, combined with a sense of style and class, delivering the intimate dining experience. Inbi brings you all the specialties of a quality sushi restaurant with a cosmopolitan ambiance as well as unique cocktails in its wonderful lounge area. Souvlakerie: Serving traditional Greek souvlaki wrapped in grilled pita bread with garnishes or threaded on small wooden skewers, accompanied by golden fries cooked in Messinian extra virgin olive oil and sprinkled with hand¬picked oregano, plus a choice of favorite Greek dishes. Conveniently located in the Agora, the Souvlakerie has tables indoors and outdoors to enjoy the most popular of Greek snacks at any time of day. KAFENIO & DELI Stop by for a cool frappé over a game of backgammon or a traditional Greek coffee slowly brewed the time-honored way on hot ash. A glass of Retsina, ouzo or tsipouro at any time of day offers a gentle introduction to the Greeks’ irrepressible zest for the good life. Combine your coffee stop with a visit to the Deli and take home the taste of Messinia with natural products – such as honey, marmalades, mountain tea and olive oil – which also make novel gifts. 3 ADMIRALS Choose from a wide selection of Greek beers from Messinia’s unique microbrewery. Check which sporting events are being televised during your stay at Navarino Dunes and be sure to book the pool table! ENOTECA Enjoy an aperitif or take part in scheduled wine tastings under the guidance of our head sommelier, accompanied by delicious snacks. Learn to distinguish the aromas and complexity of flavors. Quality wines have also been produced in Messinia since antiquity, due in part to favorable soil conditions and an ideal climate. Kayak Ice Cream Centrally located in the Agora, the Kayak Boutique store will acquaint visitors with the authentic taste of Greece’s renowned ice creams that stand out for their imaginative flavor combinations. The ice creams are freshly made with the highest quality ingredients, many of which are supplied locally. Eleon: Savor superb freshly-caught fish, inspired dishes, a magnificent selection of appetizers and delightful salads - based on the seasonal bounty of fresh, locally sourced ingredients, at Eleon restaurant. Taverna: Discover authentic Greek flavors at “Taverna” restaurant, a casual quality dining concept based on simple homemade-style dishes, prepared with great care and pride. A culinary experience consisting from the freshest local produce found in the area and cooked with traditional Messinian and Greek recipes. “Taverna”, simplicity at its best! Costa Navarino offers a recreational park featuring a water park, playground, indoor basketball & volleyball court and a bowling alley. The Navarino Racquet Academy offers an extensive range of exciting racquet sports, from tennis and squash to beach tennis. Lessons can be arranged with the professional coaching team. A diverse range of sports and other activities, including hiking, cycling and mountain biking. A team of qualified professionals is on hand to provide any assistance needed, and are equally comfortable working with outdoor novices as they are alongside the more skilled. Many of these activities are also available in the form of carefully planned tours run by experienced professionals, offering the ideal way to explore the lesser known parts of Messinia and enjoy its unique attractions first hand. The dedicated Bike Station offers a wide range of quality bikes and accessories, including IDEAL and Scott brands. Special fees apply for Navarino Outdoors activities. Washed by the sparkling blue waters of the Ionian Sea, The Dunes Beach stretches for 1 km under the warm glow of the Messinian sun. Easily accessible to guests at Navarino Dunes, the sandy, west-facing beach has a full chair and umbrella service, a beach volley court and a qualified lifeguard on duty throughout the day. The Dunes Beach is offered at no fee. “Navarino Sea” offers water sports activities and go kayaking with friends or take part in an escorted half or full day trip. Navarino Sea diving gives you the chance to explore the beauty of the undersea world and experience the wonders of Mediterranean marine life. For one day cruises, Navarino Sea yachting offers guests a memorable sailing adventure in the storied waters off the coast of Messinia. Special fees apply for Navarino Sea activities. Have fun with friends or family playing an easy to pick up sport such as Padel or stay fit and energetic with Cardio Tennis. Take tips and tailored lessons from professional Tennis coaches or challenge your partner to a Squash game in an air-conditioned indoor court. Finally, introduce your children to Mini-tennis in specially designed facilities. Fun-based sports such as Table Tennis, Racquethlon, Badminton, Speedminton, Beach Tennis & Beach Racquets are also available. Special fees apply for Navarino Racquet Academy activities. Costa Navarino Golf Academy Facilities include a well-appointed full-size Driving Range, Putting Green and Short-Game practice area. The instruction comes in various formats, tailored to the specific needs of the individual, couples, families and small groups. There is also a special program of Junior sessions and Junior Camps. Expert tuition is supported by the latest technology, such as Video Analysis and Golf Simulator. Special fees apply for services of The Navarino Golf Academy. Choose from a variety of shops such as various boutiques, jewelry shop, eyewear shop, pharmaceutical store, press corner, Navarino Collections shop, The Dunes Golf Pro shop and Anazoe shop. At Costa Navarino guests are encouraged to discover the beauty, history and culture of Messinia by engaging in authentic cultural experiences that enable them to become part of an age-long heritage spanning the millennia. 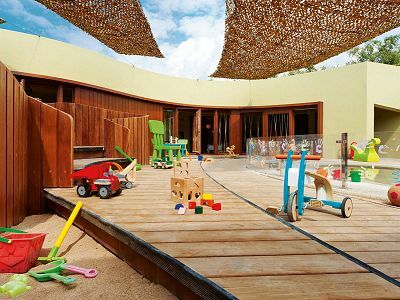 There are a wide variety of intriguing activities to choose from, both at Costa Navarino and further afield. Special fees may apply. Follow in the footsteps of the ancient Greek thinkers on a ‘Philosophy Walk’ against the idyllic backdrop of the Messinian countryside. Led by classical scholars, these walks offer a unique opportunity to discuss important modern-day issues through the prism of ancient Greek philosophical thinking and find answers to contemporary problems by drawing on the wisdom of the past. Special fees apply for participation in philosophy walks. A 90-minute guided tour of the art collections gives guests the opportunity to gain an appreciation of artworks and artifacts of the 17th-19th centuries, especially from the wider area of Messinia, including maps, engravings, rare books and weapons from the Greek War of Independence. The tour also introduces visitors to more contemporary pieces, many of which were inspired by local nature and the projects undertaken at Costa Navarino to preserve the important natural habitats of the region and maintain biodiversity. This can also be combined to Ancient Olympia. Participation in art tours is offered at no fee. Using modern technologies, this interactive exhibition center is dedicated to informing adults and children about Messinia’s unique environment in a way that is both educational and fun. Navarino Natura Hall is offered at no fee. Costa Navarino is located in the Greek region of Messinia in the Southwest Peloponnese, 50 km from Kalamata International Airport, and 310 km from Athens International Airport. Direct flights to Kalamata Airport from major European hubs including London, Manchester, Oslo, Nuremburg and Moscow, as well as a daily flight to Kalamata from Athens International Airport. Airport transfers can be organized from both Athens and Kalamata on your behalf. In addition, Hertz offer especially to guests of Costa Navarino the option of hiring a car in Athens or Kalamata to drive to the resort with a convenient pickup and drop off point within the resort. A new luxury direct coach service is organized for the guests from Athens International Airport to Costa Navarino and back to the airport. While travelling, guests will have the chance to explore and discover the beauty of Peloponnese with its wonderful diverse topography and admire the Isthmus of Corinth, the narrow land bridge which connects the Peloponnese peninsula with the rest of mainland of Greece. During the trip there will be one stop conducted at the rest area of Artemisio when driving at Costa Navarino and one in Spathovouni on the way back to Athens. Passengers may also enjoy informational spots with regards to the resort on the TVs installed in the coaches. The Anazoe Spa offers a serene sanctuary, with an exceptional menu of specialty treatments based on ancient health and beauty practices, utilizing the area's exclusive natural ingredients and unique products. 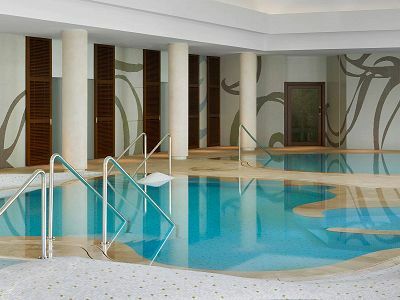 Anazoe Spa has developed signature treatments based on the teachings of Hippocrates, the ‘father' of western medicine. Therapists select the most appropriate and beneficial treatments tailored to meet the personal expectations and needs of guests. The dominant element at Anazoe Spa is the Olive Tree. The therapeutic olive-oil treatments (oleotherapy®) are based on ancient local practices inscribed on clay tablets discovered at the nearby Palace of Nestor. Further offerings at Anazoe Spa include kinisiotherapy, hydrotherapy and floating pools, indoor and outdoor treatment areas as well as an extensive range of light therapies and heat treatments, including ice-grotto rooms, mist showers and herbal saunas. Special fees apply for the services of Anazoe Spa. 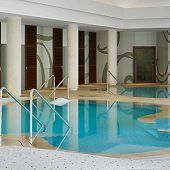 Fitness Centre: Reinvigorate at the outdoor and indoor Cybex strength and cardio equipment, or relax in the magnificent indoor swimming pool (22m), oversized Jacuzzi or spacious steam room and sauna. The Spa associates will be happy to assist you to get familiarized with the equipment and plan for any Yoga, Pilates, or Aqua Gym activity. The services of fitness centre are offered at no fee. The Cocoon care center, is specially designed for infants and small kids from 4 months up to 3 years where they can be creatively engaged and develop their skills under the supervision of qualified baby nurses and trained staff. Half day and full day packages are offered at special fees. 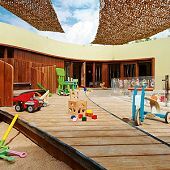 SandCastle: designed for children from 4 years to 12 years Activites include adventures with Messinian pirates, recreating life in Ancient Messini, discovering the area’s rich natural heritage, following in the steps of Hercules in Messinia, creating and painting ancient costumes. Children of all ages can learn about the environment and discover Messinia’s natural wonders and rare species, through excursions, trails and specially designed programs in collaboration with the Hellenic Ornithological Society (Greek counterpart of The RSPB) and with National Geographic. Children can also take part in craft workshops, cooking and pastry classes. Half day and full day packages are offered at special fees. Kids of all ages can visit the Aqua Park with water slides and other attractions, located at the Sports & Entertainment Center. Aqua park is offered at no fee. The Dunes Course ventures into olive groves and along a small river, whilst links-style features add to its unique playability. Much of the contouring mirrors the rugged outlines of the distant mountains. Close to the south, there is a links-like feel with tall dunes separating the holes and steep faced bunkers; further inland, it reflects a more typically Greek landscape of olive and citrus groves, and there are large undulating greens and wide fairways. Although shorter than the nearby Dunes Course, The Bay course places a greater emphasis on strategic play and position. golf. The Seaside, Canyon, and Grove holes will provide striking contrasts that create a dramatic and memorable golf round. The imaginative layout offers panoramic seaside and mountain views, including several holes that play directly along the sea and two directly overlooking the historic bay of Navarino. The Bay Course offers holes interchanging between three distinct environments of seaside, canyon and grove views, creating striking contrasts, blending seamlessly into the natural environment. The grove holes take in the olive uees dating centuries back. Robert Trent Jones Jr. commented "The Bay Course is sculpted out of the earth and rock of Greek soil, much like the marble statues of the ancients. Those deities were noble and graceful, and the golf course now reflects the same sense of beauty. This golf experience will last the test of time, to be loved and enjoyed through all the senses by those who come to play the golf course".